پهنه‌ های کائولینیزه منطقه گورگور (شمال تکاب، استان آذربایجان ‌غربی) محصول دگرسانی سنگ‌های آندزیتی به سن میوسن در شمال باختر ایران هستند. با توجه به بررسی‌های کانی‌شناسی، کائولینیت، کوارتز، جاروسیت، مونت‌موریلونیت، آلبیت، مسکوویت- ایلیت، آناتاز، کلریت، اورتوکلاز، کلسیت، گوتیت و هماتیت فازهای کانیایی در این پهنه‌ها هستند. رگه‌های سیلیسی حاضر در این پهنه‌ها شامل کانی‌های فلزی پیریت، کالکوپیریت، گالن، اسفالریت، بورنونیت و استیبنیت است. محاسبات تغییرات جرم عناصر خاکی کمیاب (REEs) با فرض Sc به عنوان عنصر شاخص کم‌تحرک آشکار می‌کنند که گسترش فرایند کائولینیتی شدن با غنی‌شدگی- تهی‌شدگی La-Nd و تهی‌شدگی Sm-Lu همراه بوده است. تجزیه و تحلیل‌های زمین‌شیمیایی نشان می‌دهند که درجه تفریق Al از Fe و تخریب کانی زیرکن توسط سیال‌های گرمابی به ترتیب مهم‌ترین عوامل کنترل کننده تغییرات بی‌هنجاری‌های Eu (84/0- 06/1) و Ce (83/0-93/0) در این پهنه‌ها هستند. همبستگی‌های مثبت و قوی مقادیر (La/Lu)N و(LREEs/HREEs)N با اجزایی مانند P، S، LOI و Sr، نقش مؤثر محلول‌های درونزاد را در پیشرفت فرایند کائولینیتی شدن آشکار می‌سازد. تلفیق نتایج به دست آمده از مطالعات کانی‌شناسی و زمین‌شیمیایی پیشنهاد می‌کند که تغییرات در شیمی محلول‌های دگرسان کننده (pH و Eh) و تنوع در نوع کانی‌های تثبیت کننده، دو عامل کلیدی مؤثر در تفریق و توزیع REEs در پهنه‌های کائولینیزه در گورگور هستند. Thekaolinizedzonesof the Goorgoor area (north of Takab, West-Azarbaidjan province) are alteration products of andesitic rocks of Miocene age in northwest of Iran. Based on the mineralogical studies, kaolinite, quartz, jarosite, montmorillonite, albite, muscovite-illite, anatase, chlorite, orthoclase, calcite, goethite and hematite are mineral phases in these zones. The silicic veins existing within these zones include metallic minerals such as pyrite, chalcopyrite, galena, sphalerite, bornonite, and stibnite. The mass change calculations of rare earth elements (REEs), with assumption of Sc as a monitor immobile element, reveal that development of kaolinization processes were accompanied by enrichment-depletion of La-Nd and depletion of Sm-Lu. Geochemical analyses show that the degree of differentiation of Al from Fe and destruction of zircon by hydrothermal fluids are the most important controlling factors for variation of Eu (0.84-1.06) and Ce (0.83-0.93) anomalies in these zones, respectively. Positive and strong correlations of (La/Lu)N and (LREEs/HREEs)N values with components such as P, S, LOI, and Sr establish the effective role of hypogene solutions in progression of kaolinization processes. The combination of the obtained results from mineralogical and geochemical investigations suggest that changes in chemistry of altering solutions (e.g., pH and Eh) and diversity in type of fixing minerals are two key factors affecting differentiation and distribution of REEs in the kaolinizedzones at Goorgoor. 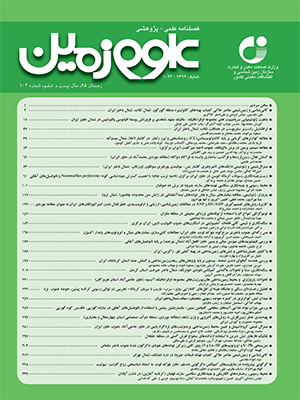 اروجی، ع.، 1391- کانی­شناسی و ژئوشیمی زون­های دگرسان و مینرالیزه منطقه گورگور (شمال غرب تکاب، استان آذربایجان­غربی). رساله کارشناسی ارشد، گروه زمین­شناسی دانشگاه ارومیه، 138ص. Abedini, A. and Calagari, A. A., 2015- Geochemical characteristics of the Abgharm kaolin deposit, NW Iran. Neues Jahrbuch für Geologie und Paläontologie- Abhandlugen 278 (3): 125-139. Arslan, M., Kadir, S., Abdioglu, E. and Kolayli, H., 2006- Origin and formation of kaolin minerals in saprolite of Tertiary alkaline volcanic rocks, Eastern Pontides, NE Turkey. Clay Minerals 41: 597-617. Asadi, H. H., Voncken, J. H. L., Kühnel, R. A. and Hale, M., 2000- Petrography, mineralogy and geochemistry of the Zarshouran Carlin-like gold deposit, northwest Iran. Mineralium Deposita 35:656-671. Boni, M., Gilg, H. A., Balassone, G., Schneider, J., Allen, C. R. and Moore, F., 2007- Hypogene Zn carbonate ores in the Angouran deposit, NW Iran. Mineralium Deposita 42: 799-820. Boni, M., Gilg, H. A., Balassone, G., Schneider, J., Allen, C. R. and Moore, F., 2004- Environmental geochemistry of Zarshuran Au-As deposit, NW Iran. Environmental Geology 46: 796-807. Daliran, F. and Walther, J., 2000- A comparative study of the sediment-hosted gold deposits of Agdarreh and Zarshouran at N-Takab geothermal field, NW Iran. Part II: Fluid inclusion study. European Journal of Mineralogy 12:1-32. Daliran, F., 2008- The carbonate rock-hosted epithermal gold deposit of Agdarreh, Takab geothermal field, NW Iran-hydrothermal alteration and mineralization. Mineralium Deposita 43: 383-404. Dill, H. G., Bosse, H. R., Henning, K. H., Fricke, A. and Ahrendt, H., 1997- Mineralogical and chemical variations in hypogene and supergene kaolin deposits in a mobile fold belt of the Central Andes of northwestern Peru. Mineralium Deposita 32: 149-163.
magmatic-hydrothermal system of Vulcano (Aeolian Islands, Italy). Journal of Volcanology and Geothermal Research 88: 325-342. Ghorbani, M., 2013- The Economic Geology of Iran: Mineral Deposits and Natural Resources. Springer, 1-569. Gilg, H. A., Boni, M., Balassone, G., Allen, C. R., Banks, D. and Moore, F., 2006- Marble-hosted sulfide ores in the Angouran Zn (Pb-Ag) deposit, NW Iran: Interaction of sedimentary brines with a metamorphic core complex. Mineralium Deposita 41: 1-16. Grecco, L. E., Marfil, S. A. and Maiza P. J., 2012- Mineralogy and geochemistry of hydrothermal kaolins from the Adelita mine, Patagonia (Argentina); relation to other mineralization in the area. Clay Minerals 47: 131-146. Kadir, S. and Erkoyun, H., 2013- Genesis of the hydrothermal Karaçaýir kaolinite deposit in Miocene volcanics and Palaeozoic metamorphic rocks of the Usak-Güre Basin, western Turkey. Turkish Journal of Earth Sciences 22: 444-468. Kadir, S., Kulah, T., Eran, M., Önagil, N. and Gurel, A., 2014- Minerlogical and geochemical characteristics and genesis of the Gözelyurt alunite-bearing kaolinite deposit within the late Miocene Gördeles ignimbrite, central Anatolia, Turkey. Clays and Clay Minerals 62: 477-499. Karakaya, N., 2009- REE and HFS element behaviour in the alteration facies of the Erenler Dağı Volcanics (Konya, Turkey) and kaolinite occurrence. Journal of Geochemical Exploration 101:185-208. Mehrabi, B., Yardley, B. W. D. and Cann, J. R., 1999- Sediment-hosted disseminated gold mineralisation at Zarshuran, NW Iran. Mineralium Deposita 34: 673-696. Modaberi, S. and Moore, F., 2004- Environmental geochemistry of Zarshuran Au-As deposit, NW Iran. Environmental Geology 46:796-807. Nesbitt, H. W. and Markovics, G., 1997- Weathering of granodioritic crust, long-term storage of elements in weathering profiles, and petrogenesis of siliciclastic sediments. Geochimica et Cosmochimica Acta 61:1653-1670. Stocklin, J., 1968- Structural history and tectonics of Iran: A review. Bulletin-American Association of Petroleum Geologists, 52: 1258-1299. Taylor, Y. and McLennan, S. M., 1985- The continental crust: Its composition and evolution. 1st ed. Oxford, UK: Blackwell. Whitney, D. L. and Evans, B. W., 2010- Abbreviations for names of rock-forming minerals. American Mineralogist 95: 85-187.